The first half of lecture one, The Being of Man, serves as Steiner’s introduction to his lecture series, and outlines his goal of giving a general survey of Theosophy, and begins by providing some background. Steiner talks about occult brotherhoods which used to possess this knowledge. Secret groups, which only put forth their second-best members, or puppets, out into the public arena, while the most knowledgeable initiates stayed in the background, controlling it all. Secret, occult knowledge was passed through encoded messages, and only those with the key could break the codes. Knowledge was meant to be put to work — to have a practical influence on society and politics. Knowledge was not simply put forth to satisfy idle curiosity. The advent of the printing press made this secret knowledge more widely available, and Steiner’s lectures start from the point of “practical occultism; they will contain nothing that is mere theory and cannot be put into practice” (p. 3). and unless I can easily find an original German manuscript and figure out a more exact translation, it is the interpretation I am going to hold to going forward. So what does the practical occult look like? Steiner then delves into the nature and being of man. For Steiner, human beings are made up of seven members. Four of these members are fully formed: the physical body, etheric body, astral body, and I/Ego. Two partly formed: Manas and Buddi. And one that is “rudiment only,” the Atma. I will address the fully formed members first. Physical body: The physical body is the one we have in common with the world. The physical body man shares much with the mineral kingdom, both man and minerals have physical bodies. Etheric body: Man is capable of thought, growing, propagating, and taking in nourishment, which is similar to plants and animals. This etheric body can be hypnotized, which dulls the senses. Theosophy requires full control of the senses (otherwise there is a danger, of what Steiner is appropriately vague). The power of self-will can suggest away the physical body, and can also suggest away the physical bodies of plants (again, unclear how). Astral body: The astral body is the seat of desire and passion. It is an egg-shaped aura of light, and impulses appear as colors and passion as lightning (how does Steiner know this?). Animals, being capable of feeling pleasure and pain, share this aspect with man as well. I/Ego: What makes man his own being, separate from animals, is the concept of “I” — the personal inner God/soul. Apparently the “I” is an empty space in the head area, tinted blue by the aura of the astral body. I am going to pause here, these four members remind me a bit of combination of Riva’s Chorus and the unquiet dead. Steiner’s perspectives are such a tremendous departure from the philosophical perspectives of Ms. Eddy regarding man as a spiritual idea of God, I’m not totally sure what to make of it all. I know what to make of Eddy’s work, but Steiner? Metaphorically, I think, maybe I can see where he is going with it, or maybe I could, until I got to the next three members: Manas, Buddi, and Atma. This is where I start to lose completely my rudimentary grasp of Steiner’s seven members club. The two partly formed members are Manas and Buddi. Manas refers to the I/ego as refined my morality, this is an unintentional refinement and occurs naturally. Buddi, is the transformed etheric body. I have no idea what that means. I’ve gone back and read, and re-read the sections and the exasperated HUH?! remains. World-soul or World-mind and as 6th principle of the human being: Spiritual soul. Called by Rudolf Steiner Life Spirit. Honestly, I’m not sure if I’m more or less confused. Steiner is quite clear that the member Atma is “rudiment only” (and thankfully defined as “The breath of life-spirit. The seventh and highest principle in man. Spirit Man” at Glossary of Indian-Theosophical Terms) this level occurs when someone has “worked down into their body” able to control breathing, circulation, nerves, thought, etc. Atma sounds vaguely like Hesse’s Siddhartha‘s enlightenment process, but it brings me no closer to understanding Manas and Buddi. For Steiner, these seven members of man’s nature allow him to participate in the three worlds — what are the three worlds? That’s lecture two. One of the things I find myself struggling with is Steiner’s use of “Soul” and “Spirit” and the book’s title’s use of “Science” in this context I find myself needing to compartmentalize the language of Christian Science and remind myself that these are not reforge to the seven synonyms of God (Life, Truth, Love, Soul, Spirit, Mind, Principle) as put forth by Eddy, and these words come with their own Steiner-infused meanings. I suspect I will spend a fair bit of time at the Rudolf Steiner Archives trying to sort out what Steiner is trying to say. I am also left wondering if I must fully grasp the concepts in this lecture before I proceed to the next one. I do not fully understand what Steiner’s being of man entails. Should I try to better understand this before advancing to the next lecture? Are these concepts that must be sequentially understood in order to be fully comprehended? 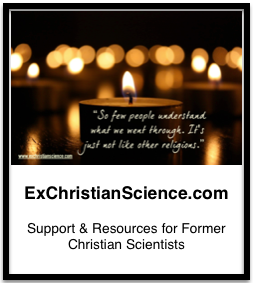 Why do some people stay in Christian Science, despite its failures? I may be repeating myself. I attended one their sessions that lasted, as I recall, from 6 pm to 10 pm. It was quietly wild. Lots of healing and scientific claims were made by the attractive female presenters. People were asked to sit still and expect healings. After that still period of time, people were asked to standup and testify to the audience about the healings they just received. It all seemed to be a quiet version versus an active stirred up faith healing version I have seen at fundamentalist churches. Also, God was sort of “indirect” versus “Jesus, Jesus, Jesus” you hear at a fundamentalist meeting. I may be repeating myself.